To enhance girls’ awareness of, interest in and self-efficacy toward the creativity needed for science and Information Communication Technology (ICT) careers while also shifting their perceptions of the nature of science to include science communication. To find new ways of supporting girls’ awareness, interest, and self-efficacy towards creativity in science and ICT careers and changes in perceptions of the nature of science to impact interest on science and ICT careers of teenage girls that would not normally identify with science interests. 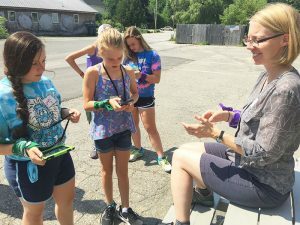 The project will also explore whether science can be made more attractive to those with low interest by featuring aspects of science like communication (one of the 8 science and engineering practices of new science education standards for K-12) that convey social relevance and significance of science to local communities and society in general. 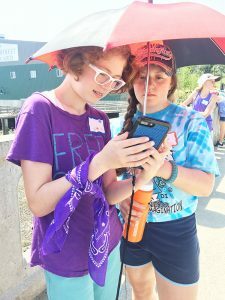 The AR Girls project is looking for Maine-based arts organization that already provide learning opportunities for young women ages 12-16 to collaboratively implement AR Girls programs at their organization. A technology kit with laptops and mobile cellular devices as well as comprehensive hands-on support from the project team to prepare for and deliver the Summer Intensive and Fall Extension. MMSA staff will lead Summer Intensive and Fall Extension activities for the girls, with support from arts educators at your organization. Continued support for art educator professional development in learning how to lead the AR Girls project.